Background: Parasites and the individuals that they attack (called “hosts”) often have a long evolutionary history of interaction. This history often plays-out as an “arms race” where the parasite finds a new way of attacking the host and the host then evolves a defence against that attack, followed by subsequent evolution by the parasite. Not only this, but species of parasites (such as the aquatic mites and protozoa that I work on) that exploit many host species can differentially affect those different hosts. In this study, we were interested in how parasitic protozoa affect closely related damselfly species that differed in their distributions. What we did: Julia Mlynarek, a PhD student at Carleton University, collected a large number of damselflies from a number of sites around eastern Ontario. The species were grouped into pairs so that we could compare between species from the same genus. 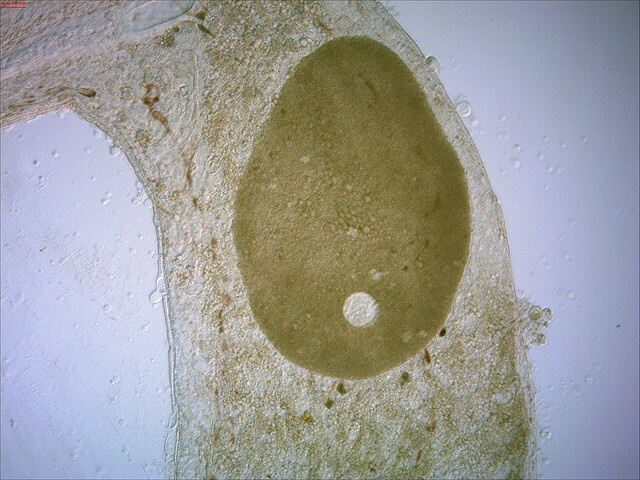 She dissected these to find the number of protozoa (like the one shown above) in guts of each animal. We found that species with smaller geographical distributions tended to have more protozoan parasites than closely related species with larger distributions. Importance: Explaining how parasites affect their hosts is a big question spanning ecology and evolutionary biology. These results suggest that there might be a combined effect of (i) shared parasites due to evolutionary history, and (ii) varying resistance due to different exposure across geographical ranges. This is part of a series of short lay summaries that describe the technical publications I have authored. This paper, entitled “Higher gregarine parasitism often in sibling species of host damselflies with smaller geographical distributions”, was published in the journal Ecological Entomology in 2012. You can find this paper online at the publisher, or on Figshare.